The PR industry is exciting, fast-paced and always on the lookout for fresh talent. PR has something for everyone: whether you are a creative media graduate, an English student with a flair for writing, or a sports fan with an interest in events. Yet breaking into the PR industry can be competitive, so here are five insider tips for getting an internship or graduate job in PR. All members of the PHA team are encouraged to attend weekly training sessions. Pictured are both permanent team members and interns during a guest speaker seminar. 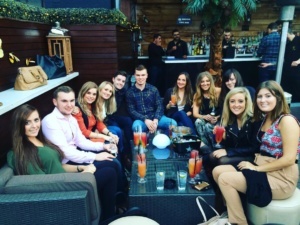 Graduate roles in PR pop up all the time, so making sure you pick the right one for you is vital. The best candidates will have researched the company and have a good understanding of their work. Going into an interview you should feel confident in your ability to talk about the company’s successful campaigns and what makes them different from their competitors; all of which shows you understand the company and PR. It’s important to remember that an interview is just as much a chance for you to find out more about the company as it is for the company to find out about you. So don’t be afraid to ask questions and engage in a discussion about the PR campaigns and events you feel passionately about. Try to name check their clients, express an interest in their founders, and if they’ve won an industry award congratulate them on this – all this knowledge will add personality to your interview and make it memorable. Your CV is the first look at your professional skills and creative experience that an employer gets, so make sure it’s a good one. Start your CV with a punchy personal summary that both grabs their attention and clearly says what you’re looking for. Try to present your experience in a way that tells the story you want it to – so that writing for your student newspaper, getting involved with event planning and working in a shop all show you have the skills necessary to succeed in PR. Even the skills you think may be unrelated to PR can be relevant. For example, working in retail demonstrates your ability to communicate with a variety of people and demonstrate a basic awareness of business. Social media is crucial to modern PR and so making sure you stay up to date with your own online channels will help you keep an eye on job opportunities and help recruiters keep an eye on you. As a free and wide-reaching tool for getting in contact with prospective employees, PR companies will use Twitter as a way to reach job-hunting graduates, so follow their tweets for updates. Be sure to keep your LinkedIn profile as up-to-date and interesting as possible, that way recruiters can easily see your skills and get in contact with work opportunities. HR insight: recruitment fees mean PR companies are eager to contact candidates directly, so having a stand-out social media presence (LinkedIn, Twitter, WordPress) allows your skill-set to reach a much wider audience in the way that you want it to. 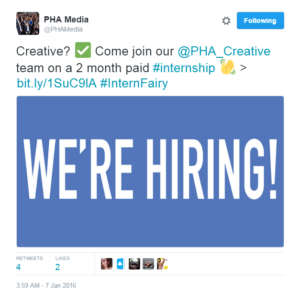 Check out The PHA Group’s twitter feed for live updates on recruitment and agency news. This might sound like an obvious one but it’s surprising just how far genuine enthusiasm can go in a competitive sector such as PR. Make sure you convey a passion for the industry and a willingness to learn in the areas you are less familiar with. It’s important to emphasise that whilst you aren’t a PR expert, you have the drive to become one, and it’s this positive approach that will stand out. So be enthusiastic about the agency, the role, the far-reaching influence of PR, and show your ability to work through the challenges that a role in PR can throw at you. If a graduate job in PR seems too daunting or out of reach, do not fear. 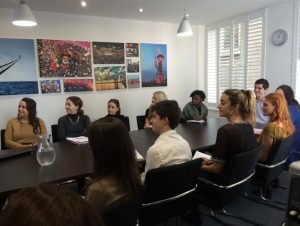 Internships and work experience are the perfect PR taster, and whilst unpaid placements can seem unfeasible in a costly city like London, they are a great way to build up your experience and get some great names on your CV while you’re still a student. Most PR companies will offer some kind of internship and these will vary in their content. The best PR internships out there will get you writing press releases, contributing in client brainstorms and speaking to journalists, so there’s plenty to be learnt and to add to the CV. We here at The PHA Group champion our interns and make sure we give them as much insight as possible into PR. But don’t despair if an internship doesn’t immediately lead to a permanent position. Employers will always appreciate a variety of experience with different PR companies. However, when your internship does finish make sure you leave the door open and stay in touch. If you’ve made a positive impression, then why not remind them of your availability and most recent work experience by dropping them an email every now and then? That way there’s no reason why you won’t be at the front of their minds when they come to recruit for their next graduate role. Socialising and keeping in touch with your colleagues is a great way to network and keep your finger on the PR pulse.